Happy Tuesday everyone! I hope everybody had a fantastic weekend! I am excited to be writing yet another recipe for you guys, and it is something I do hope a lot of you enjoy! This week I would like to use a recipe we learned in school. VEGAN PECAN PIE! Courtesy of the Culinary Institute of Virginia having a nutrition program, we had a course in that program called "Alternative Baking". Which was really fun because we got to learn the different types of dietary needs, and the many alternatives to those diets (i.e. Vegan, Gluten Free, Sugar Free, Raw/Paleo, etc.) for all those yummy desserts everybody wants to have! Anyways, the two areas I enjoyed the most was vegan, and gluten free. Learning how to make pecan pie was a lot of fun as well. 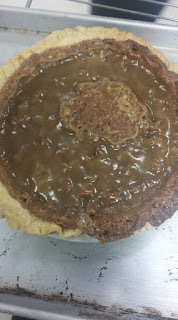 A few of the groups in our class got to make the vegan pecan pie (Pictured above). And it was quite an easy recipe to put together. There is not a whole lot to be done with this recipe either. We are just omitting the eggs, and substituting the butter in the recipe, but everything else stays the same. Remember when we talked about how we can put some tofu in certain foods or desserts as a substitute? That's right, this recipe calls for none other than silken tofu!! Tofu is a great substitute for when a recipe originally calls for eggs. It is a great binder for desserts like this. But if you recall, I did give out a little warning about what types of Tofu to use! That's right. This recipe requires silken tofu because it is easier to puree, and overall works better when it comes to desserts. You should use extra firm tofu ONLY if you are looking for a hearty replacement for certain dishes (it stays in shape for the breading and frying process). Silken tofu is the best to use for desserts, smoothies, souffles, etc. 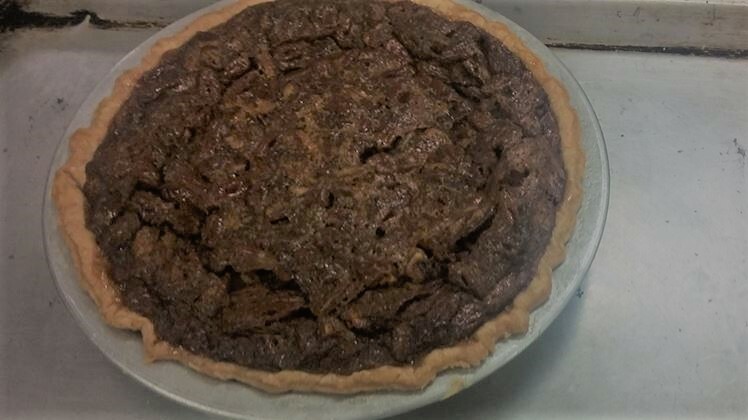 IF you end up using extra firm tofu, your pecan pie will look just like the one in the picture below. I tried pureeing, chopping, blending, everything you can imagine to that extra firm tofu to try and get it smooth enough for this recipe. Unfortunately, it did not work out at all and ended up ruining my pecan pie. Overall, the texture for me was odd at first because I knew there was tofu in the dish. And usually, once you know there's something in there, it is all you focus on tasting. BUT, once I actually opened up my mind to the idea of adding tofu to pecan pie, it really was not bad. I did not think it was sweet enough in my opinion, but I did not want to break away from the recipe. If you prefer your pecan pie sweeter, add an additional teaspoon of vanilla extract and an additional 1/4 cup of maple syrup. Overall, I hope y'all enjoy this recipe. We are getting closer to the holiday season guys! If you have any recipes you want us to write about, please feel free to message us! Whisk the dry ingredients together and cut in vegan butter. Carefully work water into the dough. (pour in some of the water, and start to mix it with your hands). This recipe is good for 2 pie crusts. So cut the ball of dough in half. Wrap the dough balls in plastic wrap, compress it until it looks like a disc, and put in the chiller for 1 hour. Roll out your vegan pie crust. And carefully put it in the pie plate. Don't worry if it starts to rip, that will happen. Just try your best to carefully piece it together. Tuck in the edges, if you have a bag of beans, place that in the center of the pie crust and bake at 325 for 8 minutes. If you do not have a bag of beans handy, just use a fork and poke around the pie crust so it won't rise. Heat sugars to boil. Boil lightly for 10 minutes. The mix will thicken. Off heat, add the margarine and melt. Cool to room temperature. Puree the tofu, non-dairy milk, and corn starch until silky smooth. Combine this mix, the salt, and vanilla. Add sugar mix to tofu. Mix and combine. Place pecans into pie shell and add filling. 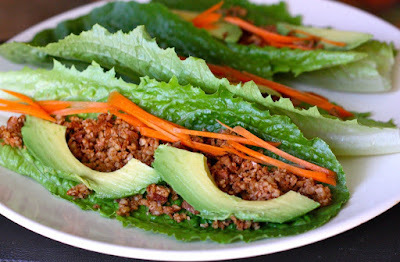 The Easy "How To of Veganism"
Vegan Taco and Nacho Recipe Ideas! We are back! New Youtube Video!